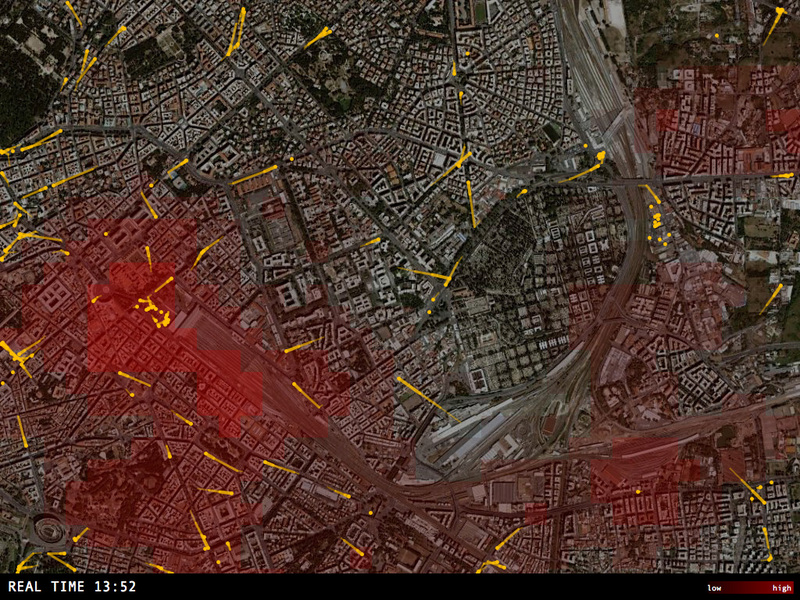 Real-Time Informatics for a "New Soft City"
What if cities could talk? Or transit systems could tell you how they’re feeling? Sounds crazy, but it’s not that far-fetched. “Urban informatics” could change the way people understand and interact with cities, says Dan Hill, a designer, urbanist and senior consultant at Arup in Sydney. He explains the idea of projecting real-time data onto the physical environment of a city, such as a lamppost or observation tower, in order to enliven public space, improve the mass transit experience, and transform the way citizens relate to their urban surroundings. Data, which exist all around us, would be accessible to everyone, rather than contained on a mobile device, such as an iPhone or laptop. Muti-sensory interaction design now merges with architecture, planning and an urbanism informed by a gentle ambient drizzle of everyday data – and so a new soft city is being created, alive once again to the touch of its citizens. Just imagine if you could use light projections, e-ink, or LEDs to display a “smart meter” of energy consumption on the outside of your home. What would change? Research shows that friendly neighborhood competition can actually breed energy-saving behavior. Likewise, imagine if cities provided free wireless Internet connectivity outdoors and in other civic spaces, like atriums, libraries and shopping malls, to encourage people to spend time socializing outside of their personal bubble at work or at home. They would literally interact with the city. Public spaces could become friendlier, safer, cleaner and more attractive. It could improve people’s health and well-being. How do the movement patterns of buses and pedestrians overlap in the Stazione Termini neighborhood of Rome? Image via SENSEable City Lab. MIT’s SENSEable City Lab aggregated data from cell phones, buses and taxis in Rome – the Real Time Rome project – to better understand urban dynamics in real time, and ultimately, reveal ways to reduce inefficiencies and lead to a more sustainable urban future. Similarly, the University of Technology Sydney’s Smart Light Fields tracks the Bluetooth signals of pedestrians to understand movement in a city. Helsinki transit and Google Maps mash-up. Screenshot via Interaction Design Association on Vimeo. 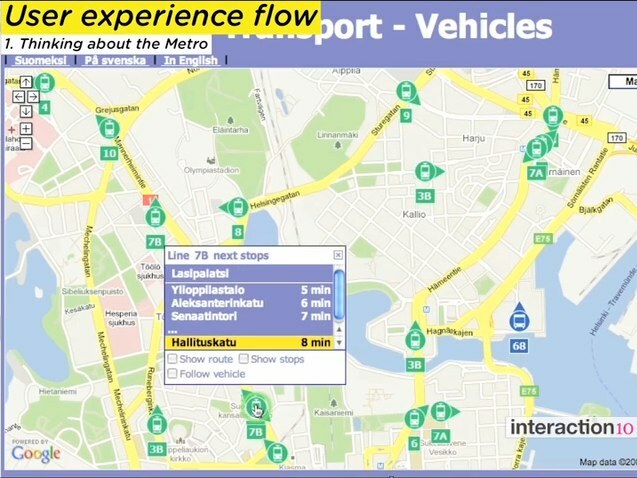 In Helsinki, Finland, GPS data from trams and buses is laid over Google Maps to show travelers where to locate their mode of transport. Hill says it makes people feel more in control of the transit network, and as a result, makes them more likely to use public transport. The project is slated for 2015. Even though it’s a modern high-tech concept, it’s inspired by old technology from the Paris Metro in the 1920s that allowed people to press a button to show the route and destinations of their preferred station on an interactive map, lit up by tiny lamps embedded underneath glass. Interactive visual displays would make transit more convenient. Screenshot via Interaction Design Association on Vimeo. Some other fun urban informatics include the LonelyLight, a pedestrian crossing signal button that is programmed to respond to pedestrians with witty comments like “that feels good, push it again”; and reActive bus stop chairs that angle towards each other when two people sit down to encourage social interaction – when the bus arrives, the chairs swing forward to remind the passengers to catch their ride. Of course, there are some concerns with broadcasting everyday data into the urban landscape. How much data is too much? Would this trample on personal privacy and anonymity? When a metro station is built to last for 50 to 100 years, how do you ensure that technology designed for today can last for that long without becoming obsolete? Digital Displays for Transit: Can More Information Mean More Riders?